Following our previous post on the passing of dear Crossfields resident, Las, we can now announce the details of his funeral and a celebration of his life. The funeral cortege will depart from Castell House on Crossfields at around 10.30am, so residents can pay their respects – especially if they are unable to attend the funeral. Following the service at the Crematorium, all who knew Las are invited to the reception at his local – the Birds Nest pub, where all his family and friends can get together and memories can be shared whilst partaking of refreshments. Anyone can register with the Considerate Constructors Scheme...but does it mean anything? Perhaps the problem is a developer wanting to cram so much onto a site that construction is only possible by using areas outside the site to facilitate it. Either way, the inconvenience caused to any neighbours of a construction site are not considered relevant when making objections to a planning application. Existing residents may be extremely inconvenienced for up to two years without compensation. • Coordinated delivery times and efficient traffic management to prevent queues of traffic accessing the site. Yeah, right. See previous posts here and here. The noise can be relentless, and exceeded reasonable decibel levels on many occasions during demolition at Faircharm. 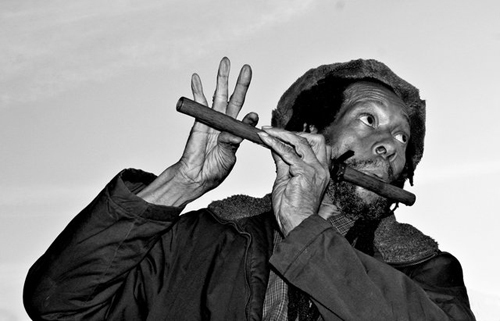 There was and is no sound reduction employed – if there is, it is not enough. • Utilising construction techniques that minimise the production of noise. See above. During demoliton, the machines used to break up concrete caused buildings to shake. Vibrations equivalent to mini earthquakes were felt by residents and those working nearby. 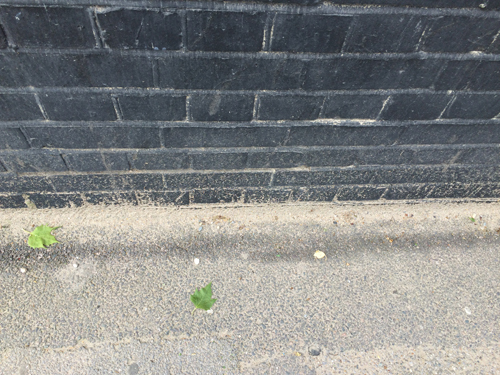 Cracks appeared in brickwork. Ornaments fell off shelves. • Using Acoustic hoarding where necessary. No Acoustic hoardings have been erected on Creekside to protect residents. Taller hoardings are required to prevent dust as well. • Ensure that all materials transported to and from site are in enclosed containers or fully sheeted. Ensuring loads are covered where spoil or demolition material is being removed. 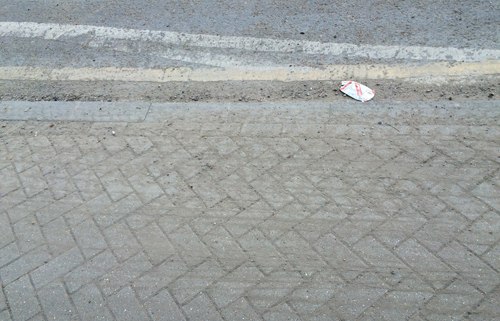 Covered or not, at Kent Wharf back in November 2015, the road looked like this for a whole month before it was cleaned up and wheel washing was finally introduced. Outside Faircharm, the trucks and cement mixers can't get in or out of the site without driving on the pavement and spreading their loads. Wheel washing as they leave the site makes very little difference. The road and pavement are almost white with dust. The dust lies several microns deep on all the parked cars and reaches into the communal recesses of Wilshaw and Holden House up as far as the fourth floor. 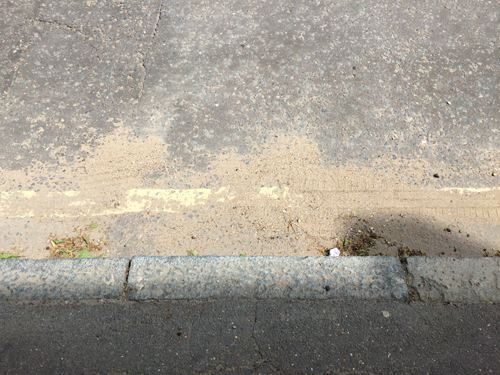 The caretakers have complained that there is ten times as much dust to clean up on communal stairs and walkways. 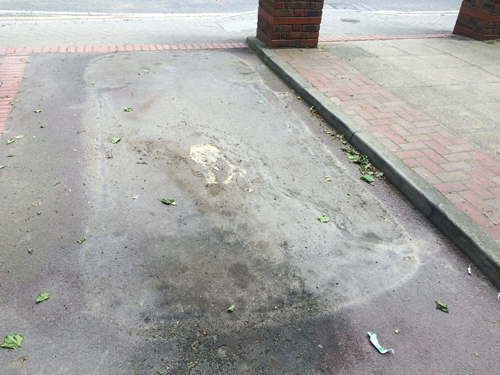 A car vacates a parking space after a rainy period, revealing the dust it's been concealing. Residents, local workers and pedestrians are breathing in all that dust. Potholes are growing daily. The wheels of passing trucks kick up the dust when it's dry. 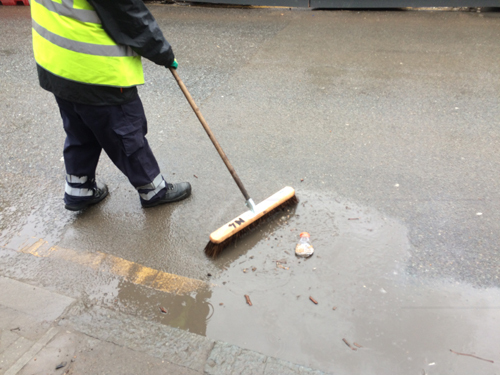 After rain, the street cleaner has to shovel mud. The rubble and dust goes down the drains, potentially blocking them. • During dry periods the works are to be damped down to control the generation of dust. Faircharm's site manager claimed to have no access to water on site and had to order in “extra tankers” of water to damp down dust. Nevertheless dust is still prevalent and not being dampened. Asbestos removal took place without full cover. This was reported to Lewisham Environmental Health who took no action and did not even respond. The construction site manager had tests conducted that vindicated the lack of cover, but extreme health worries were engendered among residents and local workers in the meantime. See previous post. • Provide regular road cleaning using road sweepers or brushes to control dust and mud. With so many sites like this in the area, a cash-starved local authority is unable to monitor the work. It is also likely that any Section 106 money clawed from the developer by the Council (in mitigation, to benefit the local neighbourhood) will not be spent around here – if it is, it will probably be used to fix the road that has been thoroughly ruined by construction. 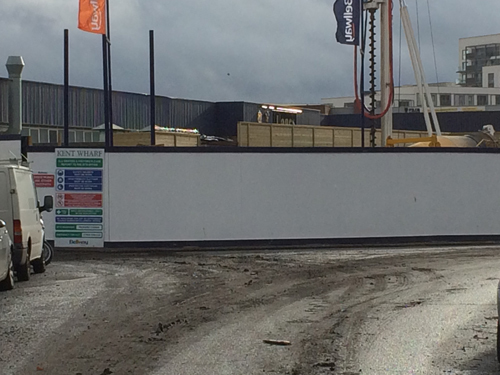 Hoardings began to be erected back in August 2015 and soon Creekside's eastern pavement (which borders the site) was lost to pedestrians. The only bit of pavement left was where the fence made allowance for a Royal Mail postbox. Once chock full of mail when serving the former trading estate, since the businesses moved out in 2014 it has remained in use to Crossfields estate residents and surrounding users such as APT and ArtHub Studios as the only postbox in the area within reasonable walking distance. In December 2015, the Post Office closed it. 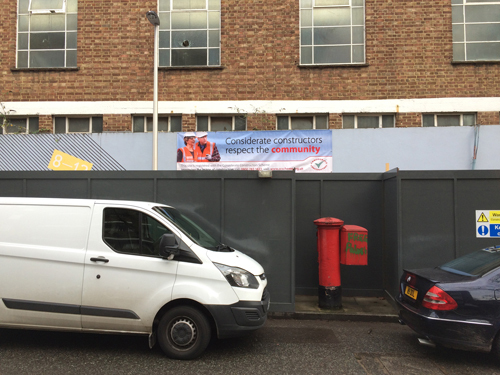 Hardly surprising since the hoardings around it were labelled with stickers saying WARNING - KEEP OUT - DEMOLITION. Some found the closure rather inconvenient – especially elderly residents with mobility problems. We complained to the Bouygues site manager who had not even noticed the box was closed. He contacted the post office and was told the delivery office manager had visited the box and deemed it unsafe for the drivers to collect. Obviously, the Post Office has a duty of care to look after its workers. But the real reason – not made clear by the post office, and as we had to point out to Bouygues – was that the hoarding around the box didn't allow enough space to open the post box to retrieve mail. And cars were parking right up close to the hoarding, making it difficult for both posters and post office to even get near the box. 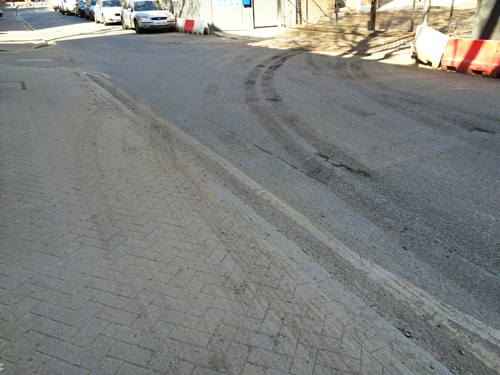 We asked Bouygues to widen the space and stop cars from parking near it – and inform the post office they had done so. But there was a delay in moving the hoarding because Bouygues also wanted to combine this subcontracting with erecting hoarding at Creekside Centre – it was the centre's fault this had not been done, apparently. The box was finally reopened on 27 January, but the busiest time for the postbox – Christmas – had come and gone. 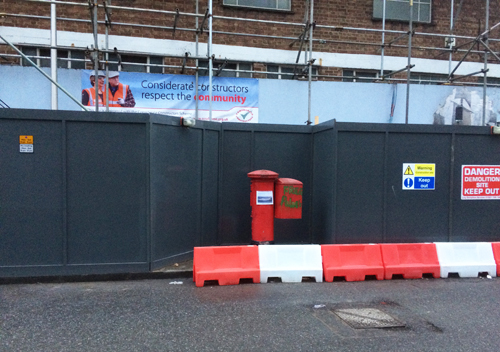 The postbox reopened at the end of January after the site hoarding was opened up. Friendly correspondence with the Bouygues site manager soon turned into regular nagging as complaints grew. Newsletter updates were promised from Bouygues but were only delivered to the residents directly facing the development despite the work affecting more than half the estate. The bollards put up by the constructors to stop cars parking next to the postbox turned out to also serve the convenient purpose of facilitating easier access for the trucks entering and exiting the site. Each truck had been having to do a three or four point turn to get into the entrance. 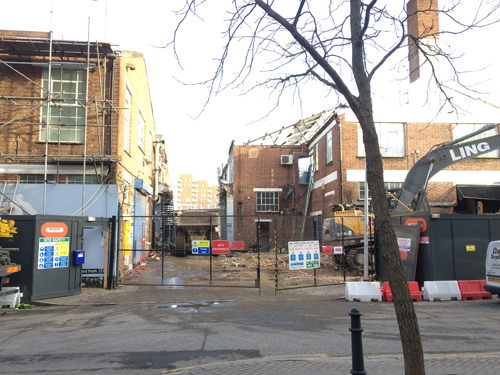 In the third week of January, the site entrance was widened. 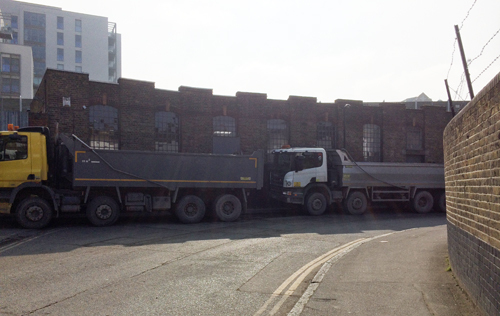 Some trucks are still taking up road space by reversing in; there is no room on the site for such manoeuvres. 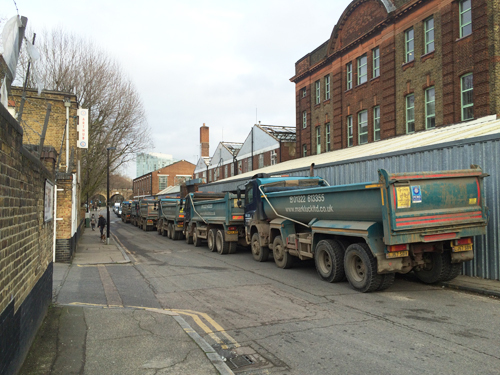 However, HGVs collecting demolition materials had already begun queuing in convoy up the road waiting to get on site – on some days as far as the Birds Nest pub, and many of them waiting longer than 30 minutes. They blocked the entrances to APT Gallery and Studios and kept their engines running – in contravention of Rule 123 of the Highway Code. No one from Bouygues told them not to. We involved local councillor Joe Dromey who confirmed that Lewisham did not have the resources to police and enforce the problem and suggested we politely ask the drivers themselves to do this. Bouygues apologised that they didn't know that APT Gallery was a public venue; the message eventually filtered through and a gap was left for the gallery entrance. More recently, however, concrete mixers (whose engines can't be turned off) form the queues. Trucks continue to use the road, spilling loads and spreading dirt. In November 2015, we'd been assured we'd be told when "lorries will begin to take materials away in bulk" and complained about the queues. The response was that it was not "bulk muckshift" but just a couple of days of taking away crushed materials – at that time, the removal of demolition materials "had not been planned" and we'd be told when the real work started. But we weren't, of course. 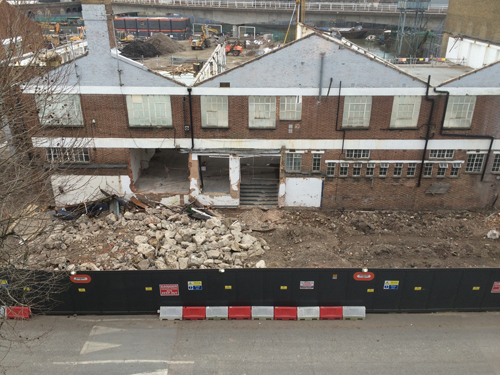 The plan was to crush materials on site, whilst some of it was already being moved off the site by the "bin lorries". 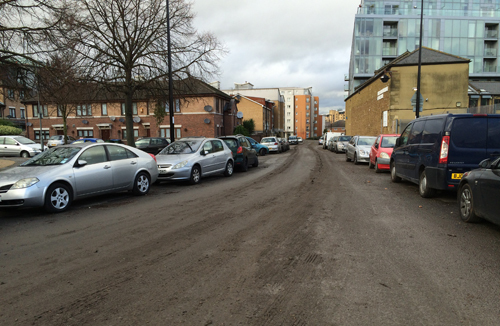 Wheel washing would be in place to avoid mud on the road, and all vehicles would turn left out of the site (southwards to Deptford Church St), as agreed with Lewisham Planning. The excuse for the fact that some lorries were turning right out of the site was that they had either come to the wrong site, or there was an accident (or too much congestion) at the Bird's Nest roundabout. 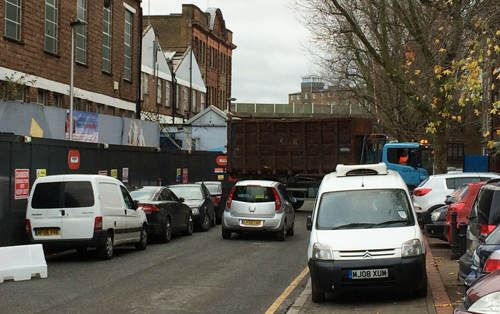 In November we asked whether Deptford Creek would be used in the removal of the demolition materials; it was a condition of the developer's planning permission that they carried out a feasibility study on transporting spoil and materials by river, rather than the 80 lorries a day they otherwise planned to have leaving and arriving at the site and clogging up our narrow back road. As predicted, the developer had wriggled out of the more environmentally clean option of using the Creek – the feasibility study had concluded it was not 'economically viable' as the Creek could only be used "either side of high tide", plus they had to be "5 metres away from the DLR and would only have one place to site barges" – the place where Creekside Discovery Centre muster for their river walks. (Again, Creekside Centre was being blamed). 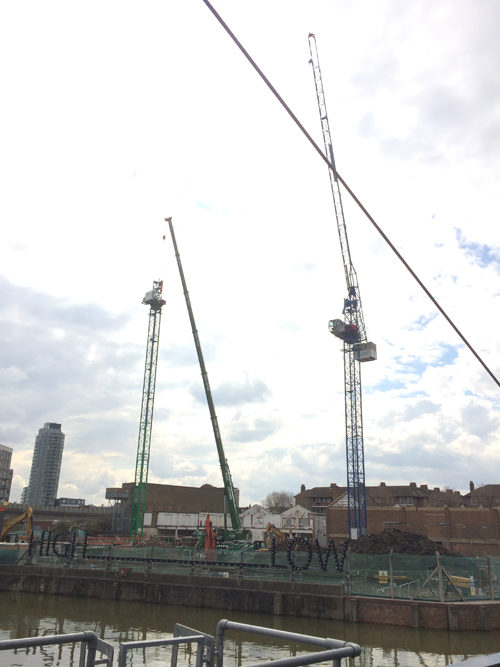 In fact, the rule about being 5 metres from the DLR does not apply to vessels on the Creek, but to structures on land – and the place they can't use is where they have built their compound offices. We also badgered the Site Manager about the dust the demolition was causing, and more worryingly, the removal of asbestos concrete roofing right opposite the estate. 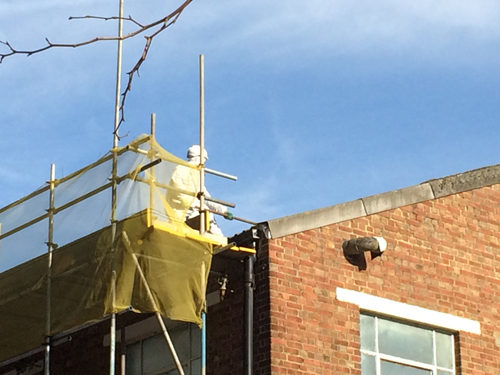 An operative wearing full protective clothing was seen bashing the roof out only yards away from residents' flats. The Health & Safety Executive (HSE) guidelines state that asbestos cement roofing is of medium risk and does not require an enclosure, except "when it is extensive and difficult to remove, resulting in much breakage and debris, or the work is close to occupied or sensitive areas" (p.90 of the HSE's guide). 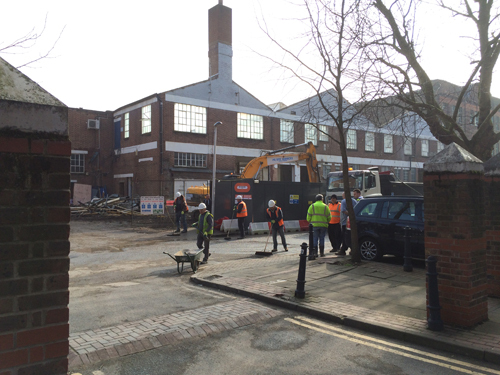 Our concerns were passed to Ling Demolition who proceeded to carry out air monitoring tests almost immediately. Testing was carried out in close vicinity to the work (on the workers themselves) but not outside the perimeters of the site. However we were assured that "fibre concentrations at the sample locations were within control limits" and "fibre levels will not be greater at locations further afield". December 2015: dust out of control, coating the surrounding area. 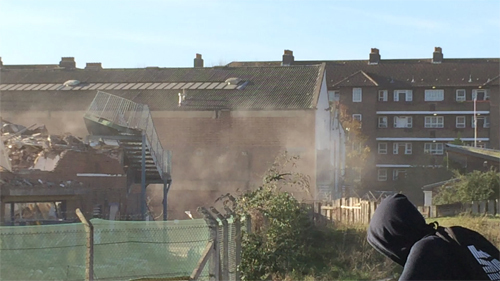 Meanwhile, our concerns about dust (coating the estate, the road, the pavements, Creekside Centre and Ha'Penny Hatch), was put down to excessive wind and a poor supply of water to the site. A 'water suppression system' was fitted to the 'high reach machine' but as a result of our complaints, additional equipment had to be ordered and 'extra water' brought in. Dust continues to be a problem however. Presumably, Creekside Discovery Centre are satisfied with all these measures, as they have a duty of care to the young people visiting the centre, and would not run their programme if they had any serious concerns. But Wilshaw and Holden House residents who bear the brunt of most of this work have complained that better screening should have been erected to protect them from the dust. More than one resident contacted Lewisham's Environmental Services and got absolutely nowhere with their complaint. Ultimately, Bouygues have a good reputation as a 'considerate builder' to maintain. But it's not looking that good to us. 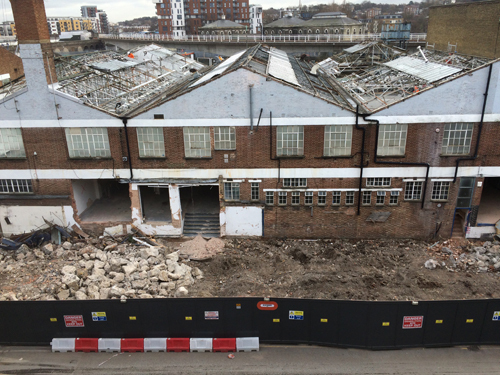 An April newsletter from Bouygues confirmed that demolition was complete, marking the end of an exceptionally noisy period during which 'groundworkers' had installed 4 'piling mats'. This was followed by the 'groundworkers' casting the substructure works and constructing bases for two tower cranes which were erected at the beginning of April. They join the other two already installed at Kent Wharf – where the same process has been tormenting residents in the north of Crossfields, and presumably all at the Laban.